Massive stage which will host the world's top talent as well as local community events. EVO Entertainment Group® announced today plans for their newest entertainment destination, a 15,000 seat Amphitheatre, as an addition to their current project at The Ranch at Old Wiederstein development in Schertz, Texas. EVO Live, the name for the massive 150,000 square foot venue, will sit on 27 acres directly behind EVO’s previously announced cinema-entertainment center, which is currently under construction. 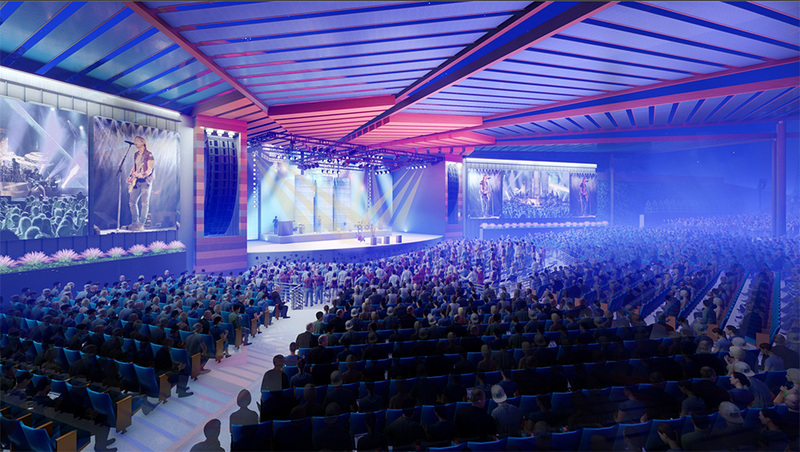 When complete, this state-of-the-art live music venue will offer multiple tiers of covered & uncovered seating for up to 15,000 concert-goers, multiple food & beverage options, private clubs & viewing areas, and a massive stage which will host the world’s top talent as well as local community events. “Music & Live Entertainment has been a passion of mine for my entire life, and something I’ve dreamt of incorporating into the EVO vision from the start,” says EVO Entertainment Group® CEO, Mitch Roberts. Together, EVO’s two projects at The Ranch at Old Weiderstein are expected to draw upwards of two-million guests to Schertz, a statistic that Roberts says is a crucial focal point for the development. “With any project of this nature, traffic and noise are going to be a concern. With that being said, being early to the market puts the project in a great position with freedom to collaborate with the City and developer to make sure we execute carefully, and responsibly for both residents and future tenants to the development,” Roberts said. In addition to dedicated parking and entry points for EVO Live, The Ranch at Old Weiderstein developer WR1, LLC. is working closely with both EVO and The City of Schertz to study traffic impact and make necessary improvements to develop an improved regional traffic plan. While no opening date has been set, The EVO Live project is expected to open next year while EVO’s next generation Cinema-Entertainment Center is on target to open in January of 2019.